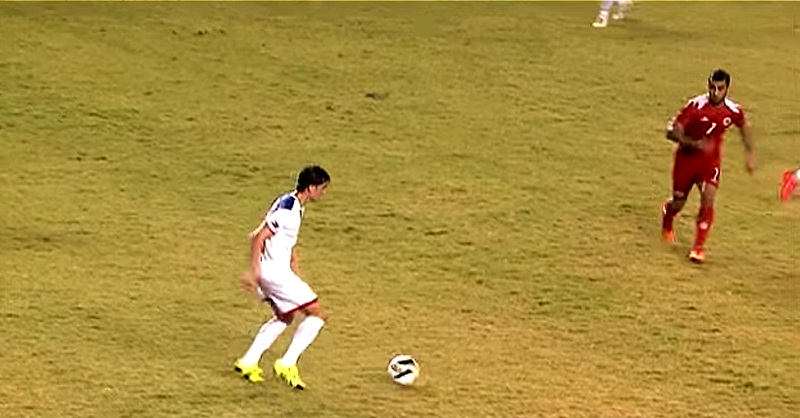 Misagh Bahadoran opened scoring for the Azkals in the 50th minute. It’s official! The Philippine Azkals have just joined the exclusive club of Asia’s Big Boys after that thoroughly professional 2-1 victory over visiting Bahrain at the start of Asian World Cup qualifying last night at the marvellous Philippine Stadium. Of course, nobody is getting carried away. This was the first of eight matches in the long road to Russia 2018; but we are the Philippines, tra-la-la-la-la. Things like this used to happen not too long ago only in adolescent football players’ dreams. Last night, it finally did happen. We will all probably look back to last night’s marquee win as our Philippine Azkals’ coming of age, pretty much in the same way that we continue to look back at Hanoi 2010 as our Renaissance as a footballing nation. After all, Bahrain in 2006 and 2010 came within a whisker of actually qualifying for the World Cup. Now suddenly, Uzbekistan, DPR Korea and certainly Yemen do not quite feel like the formidable opponents we all thought they would be; and our supposed Group of Death now feels so much less intimidating to be in. It was not just that we defeated Bahrain. It was in the manner with which we did it. They might have exposed a lack of pace in our defensive line early on with one or two over the top speculative balls; but by and large Neil Etheridge had a relatively peaceful evening. Etheridge is capable of the occasional gaffe on and off the field but enjoys a height and reach advantage over all our other keepers and is always a comforting sight in front of goal. Neil Etheridge is always a comforting sight in front of the Philippines goal. Had Javier Patiño put away a sumptuous through ball put forward by the evergreen Jerry Lucena in the 11th minute or been more accurate with an Iain Ramsay cross in the second half, then the scoreline would have really reflected how comprehensive the victory over Bahrain was. Truth be told, the real portent that it would be a night to remember did not initially come in the way of flowing football. Rather, in a cagey first half, the Azkals played with professional discipline and composure, kept their shape and were, thus, limiting Bahrain at times to hoof and hope football. This gave the Azkals a solid base to build on in the second half, when the visitors were unlocked by rapier-sharp counterattacking football. The opening goal, when it came, just had to be from Misagh Bahadoran, often the nearly man of Philippine football and for whom we all offer our prayers to God and all the saints that he might finally score a goal in an Azkals shirt. Phil Younghusband, captain on the night and playing deep in midfield, sent forward a curling diagonal cross in the 50th minute that Bahadoran, arriving from the blind side, stabbed in on the half-volley past Bahrain goalkeeper Jaffer Sayed. Ten minutes later and the Azkals had doubled their lead. 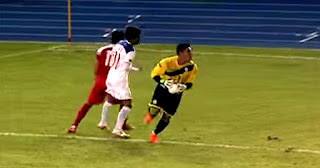 Bahrain failed to deal with Manny Ott’s freekick from the left flank; and although Bahadoran’s shot was initially blocked, Patiño was quick to put away the rebound. Abdulwahab Al Malood strolled through the entire Philippine defence in added time to give the scoreline the veneer of a close match, but the truth always was that Bahrain were comprehensively beaten and the effort was no more than a consolation goal. In fact, after the Philippines had gone 2-nil up, they played with a swagger and panache that we had all not seen before against esteemed opposition. Especially when counterattacking with swift purposeful passes, the football flowing from the Azkals was a sight to behold. Veteran Phil Younghusband was my Man of the Match. My Man of the Match: Phil Younghusband. I was mentally giving Thomas Dooley a kick up the backside for playing our most lethal marksman so deep it was almost holding midfield (or was it? ), but of course the move was an ace up his sleeve. Bahrain probably prepared for Younghusband either leading the line or partnering Patiño upfront. When playing as striker in the past, I sometimes would get annoyed at his work rate – or lack of it. Last night, he must have covered every blade of grass at the Philippine Stadium and played with raw passion and commitment. The armband suited him well! Alright, a few passes gave the ball boys the chance to earn their wages; but Younghusband did unlock Bahrain with that 50th minute cross from which Bahadoran scored.